1 Coconut Industry Board, 18 Waterloo Road, Kingston 10, Jamaica W.I. Coconut (Cocos nucifera) is an important perennial crop. Lethal yellowing (LY), a phytoplasma-associated disease, has been devastating coconut production in parts of the Caribbean. Local officials in Antigua observed widespread mortality of palms due to an unknown disease. Coconut palm, Christmas palm (Adonidia merrillii) Chinese fan palm (Livistona chinensis), edible date palm (Phoenix dactylifera), and Fiji fan palm (Pritchardia pacifica) were most affected. This new development followed previous reports of palm mortality due to LY in St Kitts (Myrie et al., 2012), an island in the West Indies with no prior history of the disease. 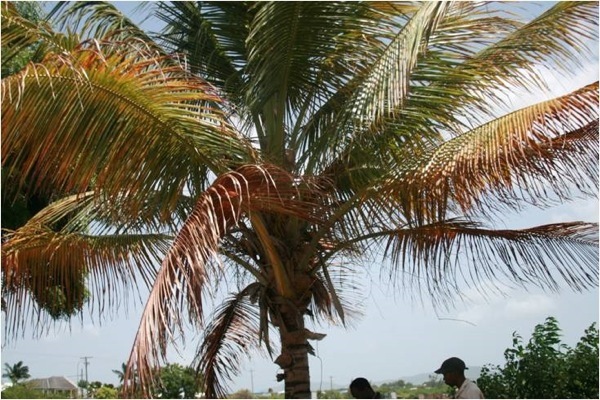 The present study was undertaken to ascertain whether widespread losses of palms currently under way in Antigua is a result of recent spread of LY disease to the island. Dead and declining coconut palms with foliar symptoms suggestive of LY disease (Fig. 1) were identified at several locations throughout Antigua. Twenty-nine palms exhibiting decline (Table 1) were sampled, DNA extracted (Myrie et al., 2012) and assessed for infection by group 16SrIV phytoplasmas. Five trunk tissues from coconuts and a queen palm (Syagrus romanzoffiana) tested positive (20.7% of the sampled palms) for infection by group 16SrIV phytoplasmas by primary PCR using primer pair P1 (Deng & Hiruki, 1991) and P7 (Smart et al., 1996) and in nested PCR using group 16SrIV-specific primer pair LY16Sf2/LY16-23Sr2 (Harrison et al., 2008). Palms were reassessed by group 16SrIV-specific real-time PCR using primers 503LY16S-ANYF/503LY16S-ANYR and TaqMan® probe 503LY16S-ANYM (Myrie et al., 2011) and with positive results in 20 palms (69%) including at least one representative of six palm species. Also, Bismarck palm (Bismarckia, royal palm (Roystonea regia) and foxtail palm (Wodyetia bifurcata), that had no prior history of susceptibility to LY, were infected. Nested PCR rDNA products (1.64 kb) in RFLP analysis produced fragment patterns that were indistinguishable (Fig. 2), but could be differentiated from Texas Phoenix palm decline phytoplasma, representative of 16SrIV-D.
Pairwise comparison between rDNA sequences (1.64 kb) derived from all six phytoplasma positive palms by nested PCRs yielded sequences that shared 99.9-100% identity with each other and 99-100% identity with comparable length rDNA sequences of phytoplasmas associated with coconut palms in St. Kitts (GenBank Accession No. JX0700937) and Jamaica (HQ613873). Representative sequences from coconut (AN6, AN28) and from S. romanzoffiana (AN21) were archived in GenBank (Accession Nos. JX560529, JX560530 and JX560531, respectively). Analysis of F2n/R2 portion of all six sequences using the Phyclassifier program (Zhao et al., 2009), confirmed the group and subgroup affiliations of Antiguan palm-associated phytoplasmas as members of group 16SrIV, subgroup A. 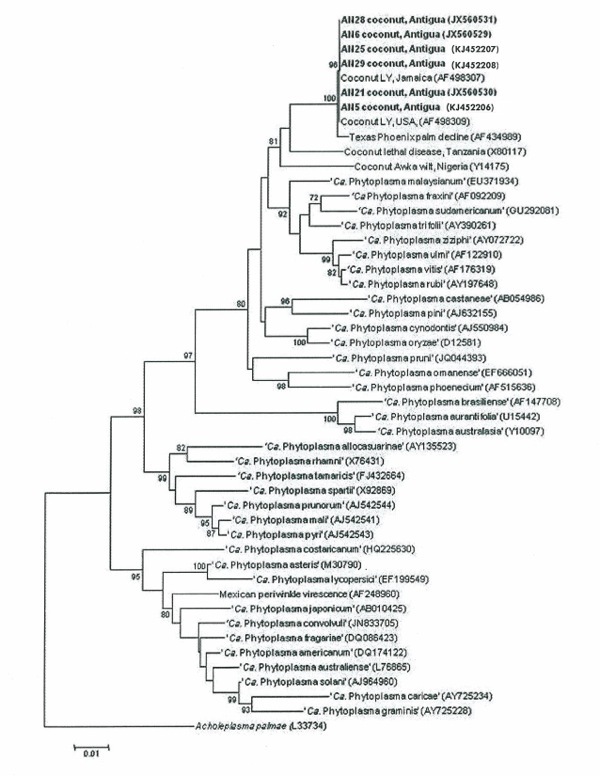 A phylogenetic tree constructed from 16S rDNA sequences confirmed that all six phytoplasma strains examined clustered with other subgroup16SrIV-A strains belonging to the coconut lethal yellows phytoplasma subclade (Fig. 3). This report will be used to inform the Antiguan authorities as to the spread of lethal yellowing disease, which will help in the establishment of phytosanitary measures. Figure 1: Mature coconut palm displaying mid-stage foliar discoloration symptoms indicative of coconut lethal yellowing disease. Figure 2: Restriction fragment length polymorphism (RFLP) profiles of phytoplasma rDNA (1.64 kb) amplified from trunk of diseased Cocos nucifera palms (AN5, AN6, AN25, AN28, AN29), Syagrus romanzoffiana (AN21), and C. nucifera (LYFL, Coconut lethal yellowing phytoplasma, 16SrIV-A) and Sabal palmetto (TPPD, Texas Phoenix palm decline phytoplasma, 16SrIV-D) from Florida. Nested PCR assay with primer pair P1/P7 followed by 16SrIV group-specific primer pair LY16Sf2/LY16–23Sr2. PCR products were digested with the following endonucleases: (A) AluI and BstUI; (B) HhaI and MseI, and (C) DraI and MluCI. pGEM® Promega, (M) molecular size (bp) markers in descending order: 2465, 1605, 1198, 676, 517, 460, 396, 350, 222, 179, 126, 75, 65, 51 and 36. Figure 3: Phylogenetic tree of partial 16S rRNA gene sequences from representative phytoplasmas in the coconut lethal yellows group (16SrIV) strains of previously described phytoplasma groups, species of ‘Candidatus Phytoplasma’ and Acholeplasma palmae. The tree was constructed by the neighbour-joining method. Representative Antiguan palm-associated phytoplasma strains sequenced in this study are indicated in bold type. Bootstrap values >70% are shown on branches. The authors express gratitude to the Minister of Agriculture, staff of Plant Protection, hoteliers and home owners for allowing us to collect samples. Myrie W, Oropeza C, Sáenz L, Harrison N, Roca MM, Córdova I, Ku S, Douglas L, 2011. Reliable improved molecular detection of coconut lethal yellowing phytoplasma and reduction of associated disease through field management strategies. Bulletin of Insectology 64 (Supplement), S203-S204. Smart CD, Schneider B, Blomquist CL, Guerra LJ, Harrison NA, Ahrens U, Lorenz KH, Seemüller E, Kirpatrick BC, 1996. Phytoplasma-specific PCR primers based on sequences of the 16-23S rRNA spacer region. Applied and Environmental Microbiology 62, 2988-2993.